I stumbled upon Siargao by mistake. I was writing an article on family-friendly surf destinations and the editor requested I include this tiny island on the eastern side of the Philippines’ sprawling archipelago. As I began my research and images appeared on my laptop screen of idyllic barrels set within a quintessential paradise and the expansive boardwalk that overlooked the island’s most famous break at ‘Cloud 9’, I had booked flights before I knew it. Two months later as we flew into the tiny airport that services the island, lush forest carpeted the landscape below me and offshore islands dotted the surrounding ocean. 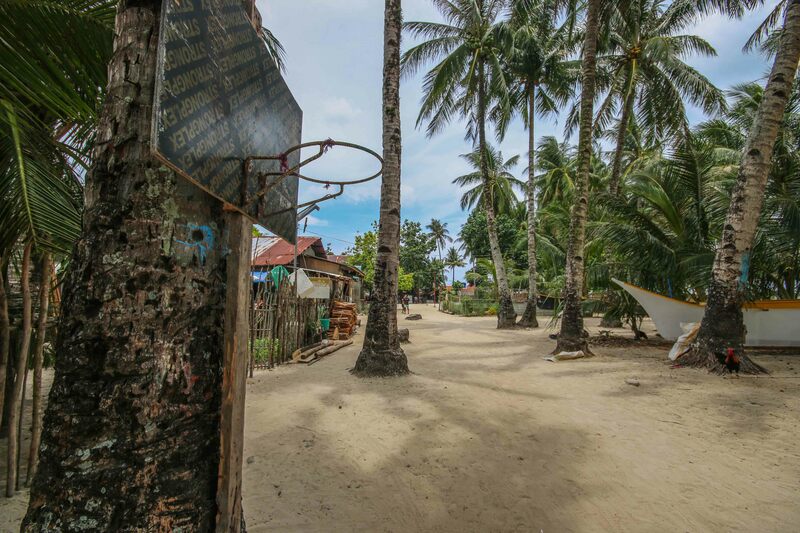 The road from the airport cut through agricultural lands fringed by palm trees and ramshackle wooden houses, while makeshift basketball courts affirmed we were in the Philippines – locals mad for this American-introduced sport like the rest of the world was mad for football. We were staying on the outskirts of General Luna, along the main road that hugged the coast all the way to Cloud 9 and was lined with surf villas and shops renting boards. On the beachfront, tidal flats stretched towards the horizon where huge waves could be seen rolling over the shallow offshore reef. This was ‘Cemeteries’, one of the area’s most popular surf spots that saw often immense barrels breaking both left and right during low tide. As night crept in we followed a recommendation to eat at a local shack known as ‘Mama’s Grill’ where we feasted on huge tuna steaks accompanied by chilli-infused soy sauce and generous helpings of rice. The food in the Philippines was often nothing to write home about, but this offering fresh from the ocean was delicious and the place overflowing with refuelling surfers. On the walk home we found ourselves lured into a small cafe where a local band was play reggae covers, with live music and open-mic nights held almost every night of the week in Siargao’s atmospheric watering holes. 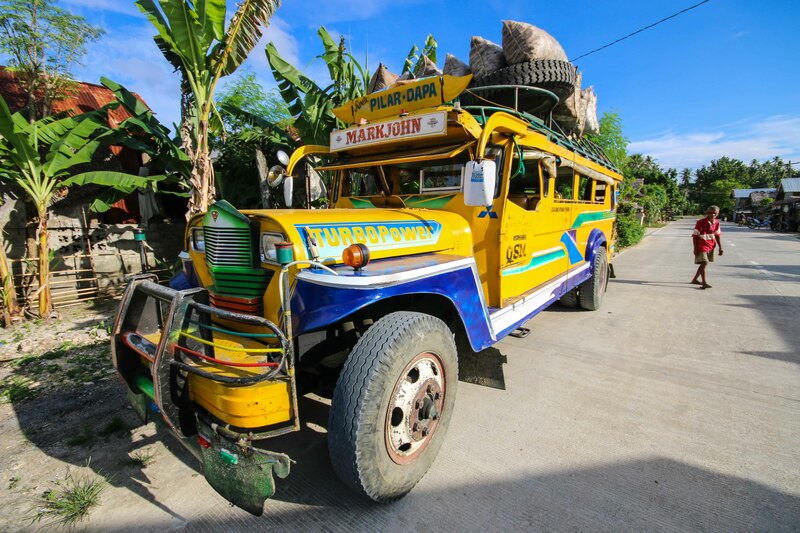 The following morning we loaded our boards onto the roof of a Hubba-hubba – a motorbike taxi fitted with a nifty roof that served not only as sun-protection but also an economic means to transport surfers and their boards around the island. Rolling into the carpark at ‘Cloud 9’, its famed boardwalk stretched into the ocean before us – a three-levelled platform that afforded spectators not only an incredible view of ‘Cloud 9’, but also ‘Quiksilver’ (named for its speed) that broke to its left and was packed with beginners taking their first steps. Despite being high tide, the shallow reef looked only centimetres deep beneath the clear water and surfers returning from ‘Cloud 9’ with blood seeping from fresh wounds made me hesitant to take the plunge. Unable to resist the urge, my partner descended the stairs and negotiated the rocky bottom that led out to the break. Five minutes later I saw him making the return journey with his board in two pieces, another surfer in the same predicament trailed behind. While ‘Cloud 9’ was legendary, it was also incredibly powerful. 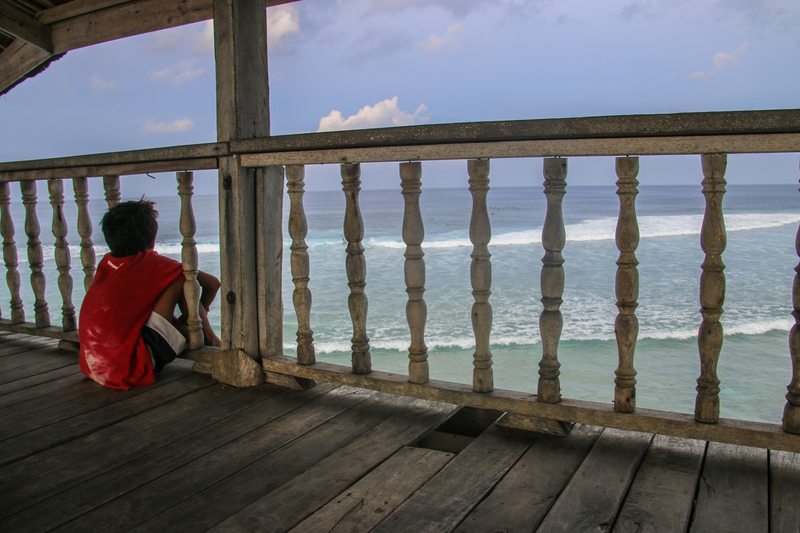 We spent ten days surfing and exploring Siargao by motorbike, driving to its north where secluded beaches offered solitary waves and sleepy villages backed onto the most perfect stretches of sand. While the area around General Luna was seeing a surge in surf-related tourist development and preparing for the upcoming World Surf League competition, the rest of the island offered the unexplored enchantment I craved when travelling. Siargao is situated to the southeast of Cebu and easily accessed by twice daily flights from Mactan-Cebu International Airport. Alternatively you can fly into the nearby city of Surigao (sounds VERY similar so be careful when booking) and get the four hour ferry across to Dapa (a short drive from General Luna) on Siargao from there. You can surf year-round in Siargao, but be aware that the island is subject to plenty of rain during the November to February monsoon season. This also heralds in some bigger swells however, and the line-ups tend to be a bit quieter. Accommodation is strung out along the road between General Luna and ‘Cloud 9’. Most of the year you can just turn up, but during the September WSL competition places get booked out well in advance. If you’re a beginner surfer there are also week-long surf camps to get you started, including surf boards, transport and coaching. For couples that want to do a bit of self-catering then the beautifully-decorated bungalows at Malijon are ideal. If you’re looking to meet other surfers then Kawili Resort has a great location by ‘Cemeteries’. They’ve also got a beach bar perfect for post-surf sundowners. Oh no! Broken boards 😦 It’s a good thing you stayed away, I think, a friend of mine was swept away in the undertow and got battered against the corals! She’s okay, but damn heavy bruising and lots of cuts and scrapes. Scary! Mother Nature definitely has the upper hand in Siargao! It reminds me I forgot to mention that booties are a real necessity there – I was without and my feet suffered a lot of cuts!